Home » advertorial » fashion » online shopping » reviews » shopping » wiwt » Glassesonline.com.sg: I'm loving my Nunettes! Don't you just love the convenience of online shopping? Practically anything can be bought online these days, and eyewear is certainly no exception. Glasses Online contacted me recently for a review and I was truly amazed by their wide range of eyewear, ranging from prescription eyeglasses, frames, contact lenses and branded sunglasses for both men and women. 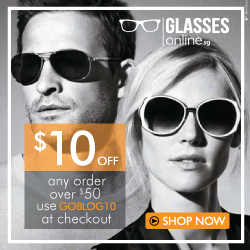 Glasses Online also offers free delivery and free 30 days return if you are not satisfied with your purchase. I was tempted to try out the coloured contact lenses, but my high astigmatism forbids me to wear cosmetic contact lenses. Hence, I continued browsing through the site and that was when I came across Nunettes! Nunettes are graphic sunglasses that have been featured on fashion magazines such as Vogue and Marie Claire. You may also have spotted them on celebrities such as Lady Gaga, 50 cent and Rihanna. I was immediately attracted to the J'adore Nunettes as it exudes versatility and sophistication with a touch of edginess. In case you were wondering, yes you can see perfectly well with these sunnies. It is similar to looking through perforated glasses that help to improve your eyesight. My face shape is probably closer to heart shape, hence narrow shades or round ones would suit me best. This is great news because I love round shades! Here are some round sunnies from Palo Wood that I absolutely adore. You can find them on Glasses Online too! All readers of Shopping Queen's Haven will also be entitled to S$10 off purchases over S$50! All you have to do is to key in the code GOBLOG10 as stated below upon checkout.